Ankhesenpaaten meant "She Lives Through the Aten"
Biography and accomplishments: Ankhesenpaaten was the chief wife and consort of the pharaoh Tutankhamun. Her father was Amenhotep who would become known as Akhenaten, the Heretic Pharaoh and her mother was Nefertiti. The parents of Ankhesenpaaten initiated a religious revolution which changed Ancient Egypt from a polytheistic religion, with many gods, to monotheism (the worship of one god). Her father had more than one wife and Kiya gave birth to Tutankhamun. Tut was therefore the half-brother of Ankhesenpaaten. After a reign of 17 years her father, Akhenaten, was forced to abdicate. He was followed by a pharaoh called referred to as Smenkhkare Ankhetkheperure - there is speculation that this pharaoh was in fact Nefertiti, but this has never been proved. 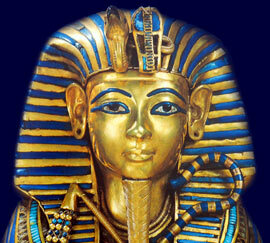 The rule of Smenkhkare only lasted two years, when King Tut was made Pharaoh. Nefertiti had only produced daughters but she arranged for her daughter Ankhesenpaaten to marry Tutankhamun ensuring that she would have considerable influence with the new Pharaoh. "My husband has died and I have no son. They say about you that you have many sons. You might give me one of your sons to become my husband. I would not wish to take one of my subjects as a husband... I am afraid." The Hittite King sent one of his sons, Zannanza, as requested but he was murdered during the journey... The desperate plan of Ankhesenamun (Ankhesenpaaten) had failed. She was forced to marry Ay. The marriage must have been a terrible time for Ankhesenamun (Ankhesenpaaten). The name of Tey, the first wife of Ay, appears as the Queen and Chief Wife in Ay's tomb there is no mention of Ankhesenamen. Each section of this Ankhesenpaaten website addresses all topics and provides interesting facts and information about the Golden Age of Pharaohs and of Egypt. The Sitemap provides full details of all of the information and facts provided about the fascinating subject of the Pharaoh Ankhesenpaaten - Tutankhamun!